The data is in. It has been sliced and diced six ways to Sunday and now it can be told. EV sales in California during the first quarter of 2017 were up 91% compared to the same quarter a year ago. 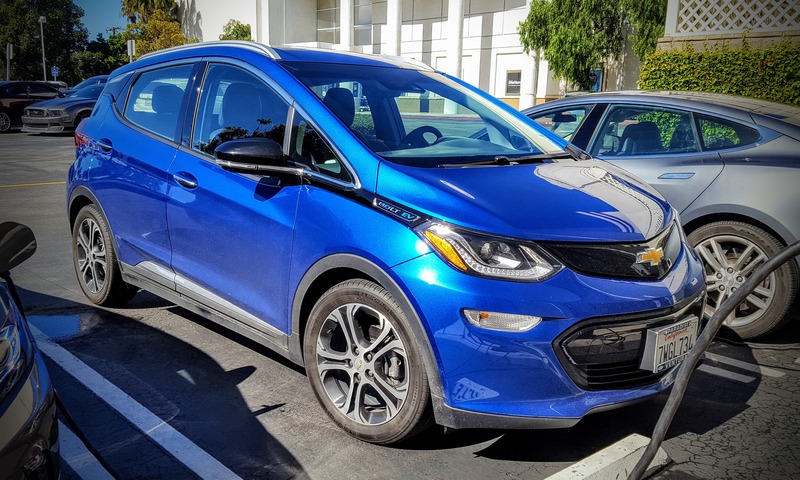 Industry observers give much of the credit to the Chevy Bolt, the first all-electric car from General Motors that went on sale in the Golden State last December. 2,735 Californians opted for the Bolt in the first quarter of the year. Rebecca Lindblad, a Kelley Blue Book analyst, said the Bolt — with its 240 miles of range — brings a “new element” to the electric car market. → Also check out our monthly EV sales reports. In all, 13,804 fully electric cars were sold throughout the state in the first quarter, made up primarily of Teslas, Bolts, and Nissan LEAFs. Sales for all cars and light trucks totaled 506,745. In total, EVs amounted to 2.7% of the new car market in California during January, February, and March. California’s Air Resources Board is promoting policies that it hopes will boost that number to 15% by 2025. “We’re a long way from getting anywhere close,” Lindblad said. Plug-in hybrid sales were up strongly. 10,466 of them were sold — a 54% increase over last year. That’s the good news. The bad news is that sales of conventional hybrids, like the Toyota Prius, were down almost 10% — 22,328 found new homes in the quarter but that is still far fewer than a year ago. Toyota invested heavily in its all new Prius for the 2017 model year but its styling may be a bit too extreme for some shoppers. The plug-in Prius Prime is selling well, however. The elephant in the room is that the Tesla Model 3 is due to start production in July. It has an estimated 500,000 reservations worldwide. If most of those turn into firm orders, the electric car market will have turned an important corner. Leaders of the country’s major automakers claim there is no market for electric cars, oblivious to the fact that no car in history has ever had anything like the interest the public has shown in the Model 3. If ignorance is bliss, as a group, they must be ecstatic. “If [Tesla] can actually deliver, that will be the best opportunity to draw in new buyers” to the electric car market, Lindblad says. For those interested in the Chevy Bolt, read Kyle Field’s 24 Hours With A Chevy Bolt article.